Fans of Aretha Franklin attend a viewing for the soul music legend at the Charles H. Wright Museum of African American History on Tuesday in Detroit. Aretha Franklin lies in repose this week in Detroit. Jennifer Jones of New Orleans says Franklin made a mark by punching through the obstacles women faced in what she calls the "hellified" music business. "We are here to respect Aretha Franklin," Lloyd said. "Her voice is a national treasure." "I think it's amazing that she lived through segregation era all the way to the first black president," said Lloyd. But she also provided the soundtrack for personal moments. And as fans waited to see the icon, they would break out in song, others in the crowd joining in. Paula Sands was with a group of women from Detroit who called for a little "Respect" before a short rendition of "Think." "She was our queen," Sands said. "May the Lord bless her soul." 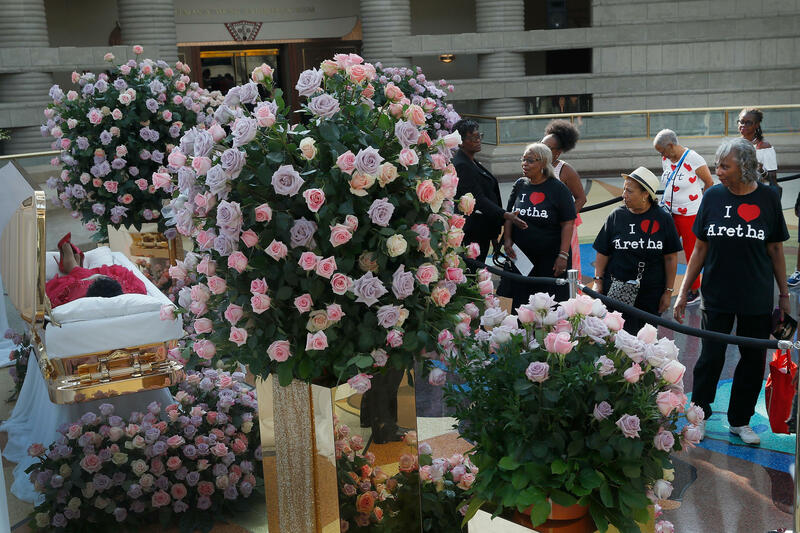 Inside, mourners heard Franklin's gospel recordings as they filed past her gold-plated casket, where she was dressed in vivid red, including her high heels, and flanked by enormous arrangements of purple, pink and yellow roses. It was a bonding moment for Sir Diego Brazil, who exchanged phone numbers with people he met. "We all just experienced history together," he said. "And love. It's awesome." Brazil came from North Miami Beach to be here for this last public appearance of someone he considers a hero. He said Aretha Franklin's music has inspired him even in the darkest of times. "Power, healing, motivation, encouragement, joy," he said. "That's what she is. She's whatever genre you are." Lisa Weber from Minneapolis could hardly speak after walking through the viewing. "I just love Aretha Franklin," she said. "Never going to be anyone like her again." Carrying an umbrella adorned with a purple feather boa, Jennifer Jones of New Orleans came to celebrate Franklin's life in the traditional Louisiana way. 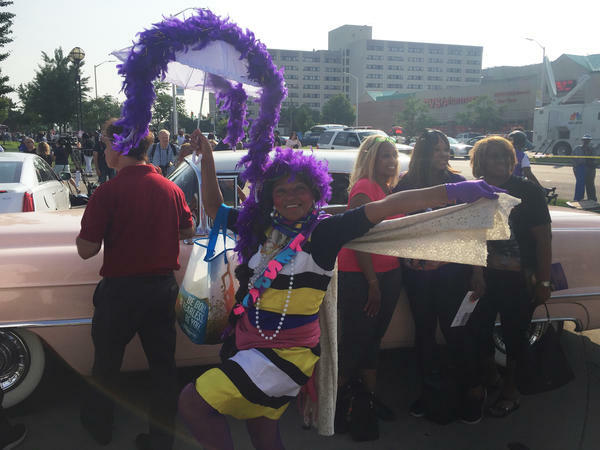 "They call me the dance queen of New Orleans so I had to honor the soul queen," Jones said, as she twirled her umbrella in the fashion of a second line jazz funeral procession. Jones' father, Joe Jones, was a music producer. She said Aretha made a mark by punching through the obstacles women faced in what she calls the "hellified" music business. "She cranked it out from her soul," Jones said. "She understood what humankind was, what the soul was, and that was what she felt was God's work and she brought it"
While Jones and others came from around the country to pay tribute, this is a particularly poignant moment for Detroit. "She was Detroit," said Donna Dugeon. "She didn't leave us." Dugeon said other artists who found fame moved to New York or Los Angeles. But Franklin stayed put and that means something. As people reflected on what Franklin did for the city, Eusebia Luna Aquino-Hughes stepped up with the story of how Aretha Franklin put her through nursing school. Aquino-Hughes said she was working in the nursing home that cared for Franklin's father, the Rev. C.L. Franklin, in the 1980s. "I was working two jobs and I was homeless paying for nursing school, and she offered to pay for my nursing school," said Aquino-Hughes. "She saw I was struggling and offered to help me — that's who she was." "Twelve of us are nurses today because of Aretha Franklin," Aquino-Hughes said. Parked in front of the museum was a vintage 1940 Cadillac LaSalle hearse, waiting to take the Queen of Soul on to her funeral and final resting place. It's the same vehicle used in the funeral processions of her father and civil rights icon Rosa Parks. 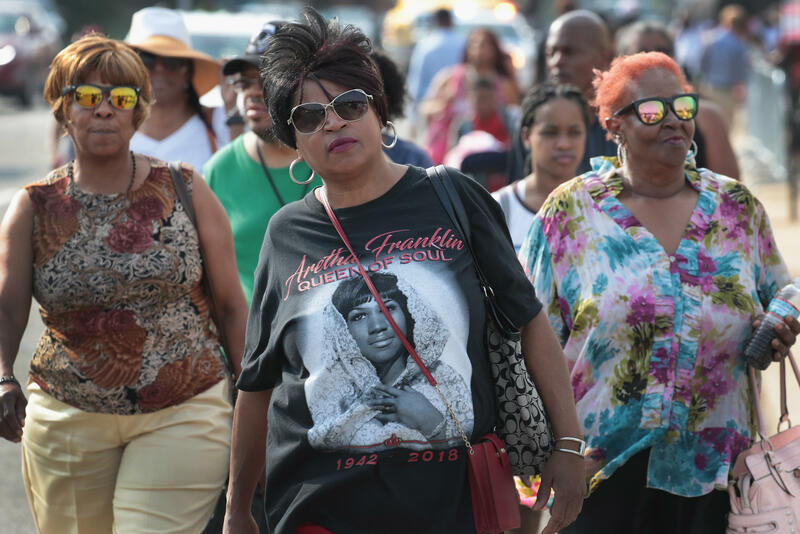 People are paying their final respects to Aretha Franklin today. She's lying in repose at the Charles H. Wright Museum of African American History in Detroit as part of memorial activities this week in her hometown leading up to her funeral on Friday. NPR's Debbie Elliott spent time with fans as they waited to see the queen of soul a final time. DEBBIE ELLIOTT, BYLINE: By early morning, the line wrapped around the building as people waited to say goodbye to an icon. SIDNEY LLOYD: This is history. This is history right here. ELLIOTT: Twenty-two-year-old Sidney Lloyd of Detroit was here before 7 a.m. He calls her a national treasure. LLOYD: We're here to respect Aretha Franklin. And she put a lot of her energy into giving back to the community. And I think it's amazing that she lived through segregation era all the way to the first black president. And she was able to perform at three inaugurations. A lot of people don't get to live through that. ELLIOTT: Fans here talk about how Franklin's music marked milestones in the nation's history from singing "Precious Lord" at Martin Luther King Jr.'s funeral to "My Country, 'Tis Of Thee" at President Obama's inauguration. But she also provided the soundtrack for personal moments. And today was all about breaking out in song. UNIDENTIFIED PERSON #1: (Singing) R-E-S-P-E-C-T (laughter). UNIDENTIFIED PERSON #2: And you better think. UNIDENTIFIED PERSON #2: (Singing) Think about what we're trying to do. UNIDENTIFIED PEOPLE: (Singing) Hey, think, think, think. UNIDENTIFIED PEOPLE: (Singing) Oh, freedom. UNIDENTIFIED PERSON #5: (Singing) Freedom. ELLIOTT: Paula Sands is with this group of women from Detroit. PAULA SANDS: She was our queen. She will forever be our queen. ELLIOTT: Inside, mourners heard Franklin's gospel recordings as they filed by her gold-plated casket. She's dressed in vivid red, including her high heels, and flanked by enormous arrangements of purple, pink and yellow roses. It was a bonding moment for many. SIR DIEGO BRAZIL: We all just experienced history together and love. This is awesome. UNIDENTIFIED PERSON #6: (Unintelligible) Keep in touch. UNIDENTIFIED PERSON #7: Travel safely. ELLIOTT: Sir Diego Brazil came from North Miami Beach. BRAZIL: I wanted and had to be here for her last public appearance, you know? ELLIOTT: His favorite Aretha Franklin? BRAZIL: (Singing) Got to find me an angel bum-bum-bum (ph) to fly away with me, yeah. ELLIOTT: While Brazil and others came from around the country to be here, it's a particularly poignant moment for Detroit. DONNA DUGEON: She was Detroit. DUGEON: You know what I'm saying? She sang in Detroit. UNIDENTIFIED PERSON #8: She still is. DUGEON: Well, she's still Detroit. But she didn't leave us. ELLIOTT: Donna Dugeon says other artists moved to New York or LA once they gained fame. But Franklin stayed put, and that means something. DUGEON: I love Aretha. My mama and daddy taught me how to - all about Aretha when I was a little girl. (Singing) Rock steady, baby, hear me now. Whoo (ph), that's what it was about. God bless you. ELLIOTT: Patricia Crawford took a bus from a Detroit suburb to get here today. PATRICIA CRAWFORD: I have so much respect for her. And people always have asked me, you know, why do you like her so much? Because she's touched my soul. And I like touching other people's souls. ELLIOTT: She remembers growing up singing Aretha Franklin songs into her toothbrush. CRAWFORD: (Singing) Looking out on the morning rain, I used to feel so uninspired. ELLIOTT: Parked out front, a vintage 1940 Cadillac LaSalle hearse awaits to take the queen of soul on to her funeral and final resting place. CRAWFORD: (Singing) You make me feel like a natural woman. ELLIOTT: Debbie Elliott, NPR News, Detroit. ARETHA FRANKLIN: (Singing) Oh, baby, what you've done to me. UNIDENTIFIED SINGERS: (Singing) What you've done to me. FRANKLIN: (Singing) You made me feel so good inside. UNIDENTIFIED SINGERS: (Singing) Good inside. Transcript provided by NPR, Copyright NPR.